« Okey dokey, back at home finally! 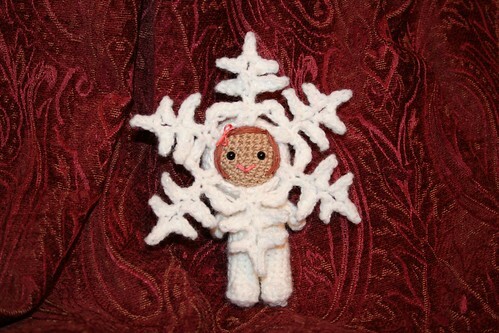 snowflake little girl, originally uploaded by *mia*. I’ve made a butterfly pattern, and a little ladybug/bird pattern but I’m not done embellishing them yet, so technically I’m not completely done. I’ve been the queen of procrastinating lately, there’s been some family issues with an imminent death that’s kind of overshadowing everything right now, and it’s the first one in my humongous family that’s going to be someone who I grew up around, someone who has directly and indirectly influenced major events and memories in my life. Oh wow, another amazing creation of yours ! !It’s beautiful !! Can’t wait to see the butterfly too ! Hi i absolutely loooovee the doll! and i’m trying to pick crochet up. Unfortunately, i have no clue about it and nothing i saw really inspired me to try it. Until i saw this! Do you happen to have the pattern for this? I know i’m a stranger but if you could pass it to me i’d be very very grateful! Thank yoU! Tanya, I sell the patterns at owlishly.etsy.com if you’re interested!